I’m often asked why I only own have one dog. It’s a good question, especially given my enthusiasm for all dog related topics. The truth is I wish I could own more – but my first responsibility is to Laika, my beloved canine companion that I currently share my home with. I’ve always had a dog at my side except for one brief 3 month period a few years back. Most of the time I’ve actually had two dogs at my side, and for a few years even three. Now I only own one dog, and she’s completely different from any previous dogs I’ve owned. I don’t want this to sound like I’m blaming her – yes, she is difficult but I strongly believe that if I had began training her earlier and with half the knowledge I know now things would be quite different. Daily walks with Laika aren’t always what I would consider stress free. Luckily we live in a rural part of town so the chances of us meeting a small dog, bike, garbage truck, or anything else she deems her enemy are quite low. But it still occurs. She’s gotten much better with a lot of desensitization and training classes but she still refuses to see these certain things as anything other than something that must be destroyed. If I had a second dog I wouldn’t feel comfortable walking both. It’s hard enough for me to keep control of Laika at times – I don’t want to imagine what it would be like to control two large dogs, especially if said second dog picks up on her reactivity and also decides to lunge and/or bark. I suppose I could walk them separately but given the fact that I work it would cut down on the length quite a bit. What’s the point of having two dogs if they can’t participate in daily activities together? It could be done, but it doesn’t seem ideal. Although Laika no longer resource guards her food or toys from me she still exhibits guarding behavior when it comes to other dogs. I’ve had dogs over and it all goes well until our guest dog touches something of hers. It’s really not pleasant, and unfortunately it’s not something we’ve been able to completely correct or manage. She resource guards me from other dogs. It was really shocking the first time I witnessed it; Laika was only 6 months old or so and as I went to pet another friends dog she quickly intervened by growling and snapping at the other dog. Given the fact that she was so young most people thought it was “cute” – she was protecting me. It’s not protection, and I’ve learned that there’s nothing cute about it. We’ve been slowly working on the resource guarding around other dogs with a trainer. It’s not going as well as I had hoped but there is some progress. If I were to get another dog how could I trust them alone together? I assume I’d have to feed them separately. Would Laika get used to sharing or would it always be a potential fight? I don’t think it’s worth the risk to find out. I could go with the crate and rotate routine but what’s the point of having two dogs if they can’t be ‘free’ together? Are “only dogs” happy? Do they miss out by not having canine companionship at home? 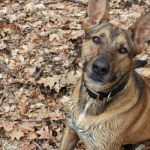 Her reactivity or resource guarding can come on suddenly in my eyes – if I were a trained professional perhaps I’d see some warning signs, but I’m not. I’m an average dog owner trying to do the best I can to manage my dog. Tail raised and licking lips – I see those signs. What I am failing to see is how she’ll be playing with a dog, rolling around having a great time, then suddenly she snaps. All the dogs I’ve had in the past would get into little tiffs occasionally when playing – it’s usually a growl and one snap to let the other dog know “enough.” Laika always wants to take it further. I love the bond Laika and I have. She actually listens to me, and I try my hardest to listen to her. Every day we find stuff to do that we both enjoy whether it’s frisbee, nose work games, tug, puzzles, the flirt pole. I’ve never had just one dog before and it’s really amazing how well I feel I know her. We depend on each other for entertainment – whether it’s a fun game or some training sessions. I love having one dog, but does a dog like being the only dog? Is a human really entertaining enough? Is my inability to roughhouse to her liking somehow depriving her of something in her nature? I love my dog. I wouldn’t trade her for the world. She’s forced me to learn things about dog behavior that I once thought was only for experts. Although her behavior can cause me stress at times when I’m with her I’m so focused on her behavior I forget about my own problems. It’s all about making her comfortable and reducing her stress. I enjoy seeing her improve, it gives me a certain pride that I haven’t had before as a dog owner. The dogs in my past knew how to relax, knew how to relate, and knew how to have a good time. With Laika I’m trying to get her to that place – we’re getting (slowly) closer to that it each and every day. I often think if I had already owned a well adjusted dog when Laika came into my home things could have turned out much differently. My older, wiser dog could have shown her the ropes – taught her all about proper doggie etiquette. If I bought another dog home at this point I’d be just as fearful that she would teach them her bad habits. I love having two dogs, don’t get me wrong. Seeing them play all day long and cuddle up at night is one of the best feelings in the world. I’ve experienced it many times with all the dogs in my past. It does sadden me to think Laika’s missing out on true canine companionship. She has a few close dog friends that she gets to play with at least once a week but it’s nothing like all day wrestle mania in the living room. I have to be honest with myself – I don’t know if I could handle two dogs while I own Laika – and that’s something I’m not willing to fail at. Are Some Dogs Better as “Only Dogs”? I always see dogs at the shelter that are labeled as “not dog friendly” and I’ve always wondered about that statement. 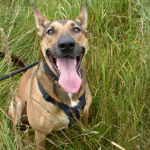 Are some dogs really unable to happily live with another dog? Is it due to poor socialization or abuse? How do you manage multiple dogs when one is either a resource guarder or reactive? 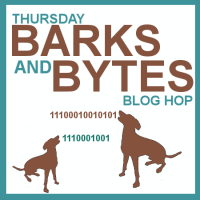 The Thursday Bark & Bytes Blog Hop is hosted by 2 Brown Dogs and Heart Like A Dog. The Bark & Bytes Blog Hop is for anything at all and all bloggers are welcome to join. 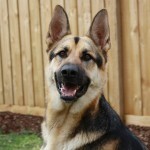 You Want A German Shepherd? « Adopt Ella – Gentle Collie Mix – Adopted! When I was about 12 years old our 2 year old Bullmastiff suddenly attacked our older Yorkie while we were watching a nature show about wolves. The wolves were growling, howling and suddenly our lives were turned upside down. Our Yorkie survived, but needed emergency care and stitches. From that moment on, we had to keep them separate for the rest of our Bullmastiff’s life (~7 years). It was a real challenge. I respect you for choosing to just have one dog because it seems what is best for Laika. When we went to adopt our third dog, the only criteria I had was the new dog had to be small enough that it Nelly would be likely to survive “an incident.” With 3 dogs I have to be careful about giving them treats, which ones can they have anywhere, which ones are given only in the crate, etc. Overall they get along pretty well, but break out a high value treat and there are some resource grabbing and guarding issues. Thank you so much for sharing. The situation that you describe is my biggest fear about adopting another dog. I’d hate to have to separate them – it just doesn’t seem like it’s worth the risk. I really did luck out growing up with so many ‘easy going dogs.’ I’ve never had to personally deal with separation or breaking up fights, and I don’t think I want to start now. Thanks again for sharing. I’m glad you shared this. We are also a one-pet family, simply because we think it’s what’s best for our dog. I would LOVE to be able to adopt a puppy mill rescue or a special-needs kitty, and it would be great if we were also able to foster…but Riley can be very aggressive toward other animals, and it’s difficult to predict how he’ll react to things. By no means is he difficult to handle – he only weighs 20 pounds! – but given that he is a senior dog who has lived in a one-dog household his entire life, it doesn’t seem fair to put him in a situation we know he’ll hate. 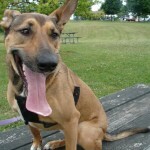 It sounds like Laika is similar – you are doing what’s best for her and what will make her happy. Your statement, “That’s not something I’m willing to fail at,” is very wise…in these cases, it’s always better safe than sorry. And Laika is still young enough where you can always work on that in the future. I’m not sure what makes some pets better as “only pets”, but I definitely think it can happen. In Riley’s case, he lived with an elderly woman until he was 7, and I don’t think he was socialized much at all. He was used to having one person all to himself, and that explains a lot of his behavior. Thank you for the comment – I agree completely. It would be heartbreaking to bring another dog into my home only to have it not work out. I’d then be stuck with the possibility of having to rehome the second dog which is something I don’t ever want to consider having to do. I absolutely think some dogs are better as single dogs. It doesn’t mean there is something wrong with the dog either. I think Freighter is one of those dogs. In a lot of ways he is a very independent dog and a throwback to old time Chessies. Storm’s breeder told me that the worst dog fights he ever saw started off as two dogs playing and then one gets ticked and then it is on. We are careful about letting our dogs play together. Also Chessies tend to protect their people, places and things. It is breed characteristic going back to the beginning. We work very hard to make them understand that they don’t need to protect, but sometimes that instinct kicks in and you just have to keep working on it. 🙂 Hubby says he likes that he has three hunting dogs to choose from but three dogs is a lot of work! I didn’t realize playing could lead to such bad dog fights, but I’ve certainly seen it with Laika. And as far as the protection aspect goes I understand that as well. I see a lot of people looking for “guard dogs” and I hope they realize many dogs are natural protectors, it’s not something you’re going to want to develop further. I think it’s wonderful that you know your pup and know that you are better with one dog. A lot of people don’t take the behavior or actions of another dog into consideration, and it ends up messy and with one of them ending up in a shelter most of the time. Good on you! It sounds to me like you’re being a very responsible dog owner. It also sounds like Laika would not like a canine companion. It’s interesting. 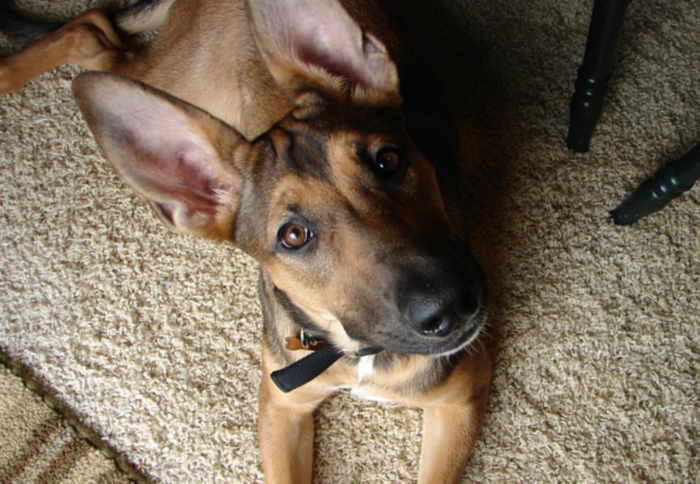 Years ago my dog, Benji, did not have any of the issues you sited, however he never was interested in other dogs. Not even his “brother.” Tolerant, yes. Pleasant even. We used to joke that Benji thought he was a people, not a canine. Dogs are individuals, so perhaps, like people, some prefer to be solo onlies. Thanks for the response, in my heart I feel like I’m being responsible and yet part of me easily falls in love with the dogs at the shelter and wishes I could bring another one home, though I realize it’s not likely going to work out better for us I do that. I believe some dogs are absolutely solo-dogs, and I think it’s absolutely wonderful and responsible to sort out that the family is best with one dog and that you are offering Laika the best possible scenario for her. No doubt some people don’t, and then run into problems and the whole household suffers (keeping dogs separate, etc). We have a cat who is like that, for sure. That said, I too wonder about the shelter statements. I am sure that some shelters, with a really knowledgable behaviorist on hand, can determine that NO other dogs are compatible with that one and it’s not a single analysis in a highly-stressed time or environment. It’s really hard for a dog with that label to get adopted, so I’d hope that it was a really educated and thorough eval. Terrific article, and subject too! Thanks so much. I am always so curious about how much effort goes into temperament testing and safer tests at the shelter – I know one of our local shelters tags dogs as non dog friendly if they bark in the kennel after being let out of their cage. I don’t necessarily think that means they wouldn’t get along, to me it’s just a stressful situation for the dog and it’s so hard to gauge true personalities in that setting. Thank you for the response – I didn’t realize Shiner and Laika had so much in common 🙂 I find Laika is still pretty iffy when it comes to people or dogs on her property but she’s so much better anywhere else. It really makes me cautious when I hear that people want a “guard dog” because I wonder if they realize how uncomfortable it can be when your dog really is protective of their territory. It’s not something I’d ever train for, we’re trying to train her out of it. I’m pretty sure Laika wouldn’t do so well with another dog either, but I still get the fuzzies for certain dogs at the shelter and I have to realize that we can’t save them all. Thank you so much for the kind words – I think those that have questioned it are people that aren’t necessarily all that close and don’t know how much training we’ve done to get this far. I loved this post. I think you are making the right choice to have only one dog for now. If you ever decide to add a second, I’m sure you could make it work but that doesn’t mean you should. You should do whatever you want. I feel fortunate my dog is the type that can get along with all other dogs, and I really, really want a second dog. I’m sure we will get one eventually, but one of the reasons I have put it off is because there are some benefits of having one dog like you mentioned. I can walk Ace easily because it’s just him. I can spend the time training and exercising him and giving him attention. With another dog, that time will be spread out between the two and I will feel a little guilty. And what about traveling with two dogs? Or boarding two dogs? Having that second dogs just make everything slightly more challenging.